The year is 1775. British General Thomas Gage sits in Boston, facing a brewing colonial insurrection. He had garrisoned extra troops in Boston late in 1774, but now he holds in hand orders from the Crown to take decisive action against the insurgents. Across the Atlantic, King George III ominously writes to the Lord of Sandwich on July 1, 1775: "I am of the opinion that when once these rebels have felt a smart blow, they will submit; and no situation can ever change my fixed resolution, either to bring the colonies to due obedience to the legislature of the other country or to cast them off!" A war set to change the course of history has begun. Volume V in the COIN series allows players to relive the struggle of the American Patriots against the British government. Building on series creator Volko Rhunke's innovative work, designer Harold Buchanan has applied his knowledge of the American Revolution to craft a new perspective on the struggle that build a nation. 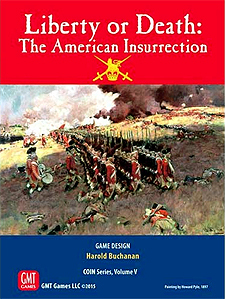 Liberty or Death: The American Insurrection showcases all aspects of the rebellion, including rabble-rousing and partisan missions by the Patriot militia, skirmishes and even full-blown battles between the British and French regulars, British control of the seas, French intervention, and conflict with the Indians across the Colonies and Indian Reserve. Liberty or Death: The American Insurrection features the same card-assisted counterinsurgency (COIN)framework as Andean Abyss, Cuba Libre, A Distant Plain, and Fire in the Lake with a set of twists that truly evoke the 18th Century. With an event deck of 109 cards, multiple solitaire modes, short and long duration scenarios, and the option for random or period events, Liberty or Death has endless variety to try players' souls.